To restore and preserve access in chronically occluded veins, John Gurley, M.D.2 developed the Inside-Out® approach – allowing clinicians to change the standard of care. To restore and preserve access in chronically occluded veins, John Gurley, M.D. developed the Inside-Out® approach – allowing clinicians to change the standard of care. 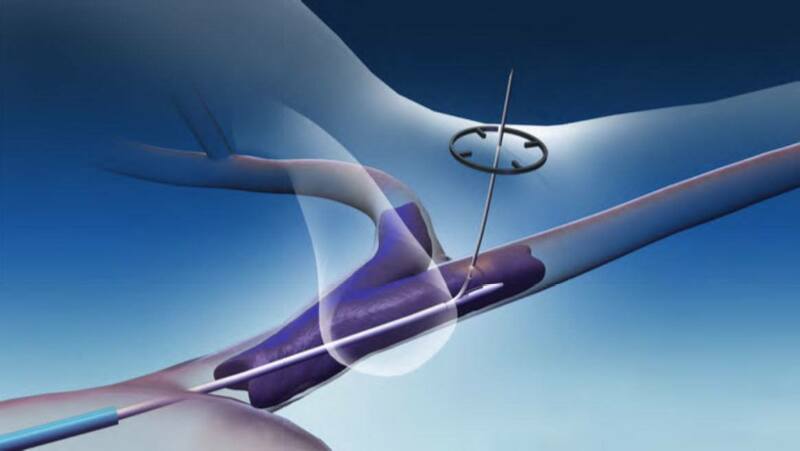 The Surfacer® System is inserted through the femoral vein and navigated to an exit point in the right internal jugular (RIJ) vein. This proprietary Inside-Out® approach achieves access to an occluded RIJ vein while preserving the viability of secondary central veins. TO LEARN MORE, CONTACT BLUEGRASS VASCULAR TECHNOLOGIES, INC.
All 12 patients received an access catheter, which remained in place and functional throughout long-term follow-up of 14 days. 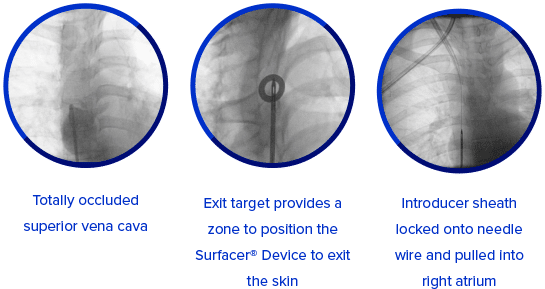 Results demonstrate this novel Inside-Out® approach provides safe and effective percutaneous central venous access, despite chronic occlusion of the superior vena cava. Department of Cardiology, University of Kentucky, Lexington, KY, USA. b. At 48-hour and 14-day follow-up unrelated to the Surfacer device. Manual compression was not required.